Philippine sunbirds are mostly diminutive in size, and the Flaming Sunbird is no exception. At a mere 95 mm (3.75 inches) total length, it is one tiny bird. Even with a 700 mm lens, I needed to get close to decently fill the frame with the subject. I got the chance to do this at Mt. Makiling in 2007 when a patch of bird-of-paradise plants were abloom at the lower slopes of the enchanted mountain. A wide variety of sunbirds descended on the flowers to sip nectar, and I had a field day shooting the tiny beauties up close . 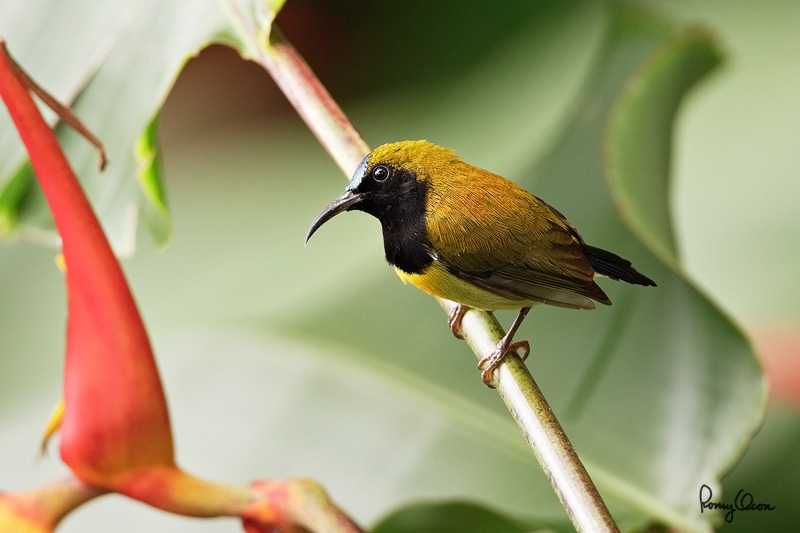 Endemic to the Philippines, the Flaming Sunbird is found in Luzon, Catanduanes, Guimaras, Panay and Negros islands. Shooting info – Mt. Makiling, Laguna, Philippines, November 3, 2007, Canon 40D + EF 500 f4 L IS + Canon 1.4x TC II, 700 mm, 1/60 sec, f/6.,3 ISO 800, manual exposure in available light, 475B/3421 support. A documentary clip of a Flaming Sunbird at Mt. Makiling.